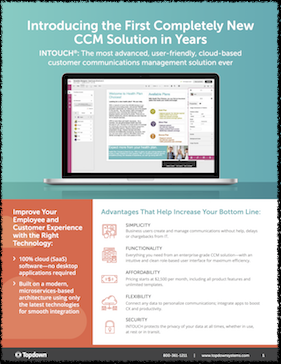 Meet INTOUCH® — the most advanced, user-friendly and affordable CCM solution ever! Business users create and manage communications without help, delays or chargebacks from IT. Everything you need from an enterprise-grade CCM solution—with a slick, context-sensitive user interface. Pricing starts at $2,500 per month, including all product features and unlimited templates. Connect to any data source for better customer experiences; integrate apps to boost employee productivity. INTOUCH prevents unauthorized access and protects your customer data while in use, at rest, and in transit. INTOUCH has the Slickest UI and Best User Experience! The first time you see INTOUCH, you feel the difference. It doesn’t just look better than other communication “solutions” or “platforms”, it works better, too. Or rather, you work better when you use INTOUCH. INTOUCH is a completely new, 100% cloud (multi-tenant SaaS) CCM solution. It has a modern, microservices-based architecture and uses only the latest technologies. That means you'll see short time to value from the INTOUCH content services application and extended ROI from the underlying services. INTOUCH Pricing Is Transparent and All-Inclusive! Some CCM vendors offer a base package and hundreds of add-on line items. Many require expensive customization after you’ve purchased. Not INTOUCH. You get all the features you'd expect from an enterprise-grade CCM solution for an incredibly low price. A modern customer communication solution needs to have multichannel document authoring and workflow capabilities. Solutions like INTOUCH that have these capabilities are a good fit for insurers looking to improve their digital customer experience. Check out these resources for business and technical readers. 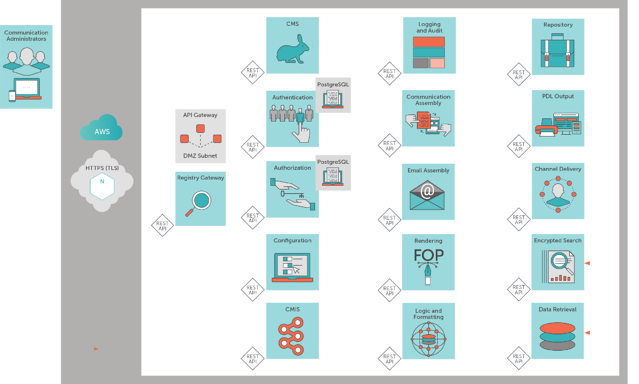 Get an overview of INTOUCH, Topdown's cloud-based CCM software. 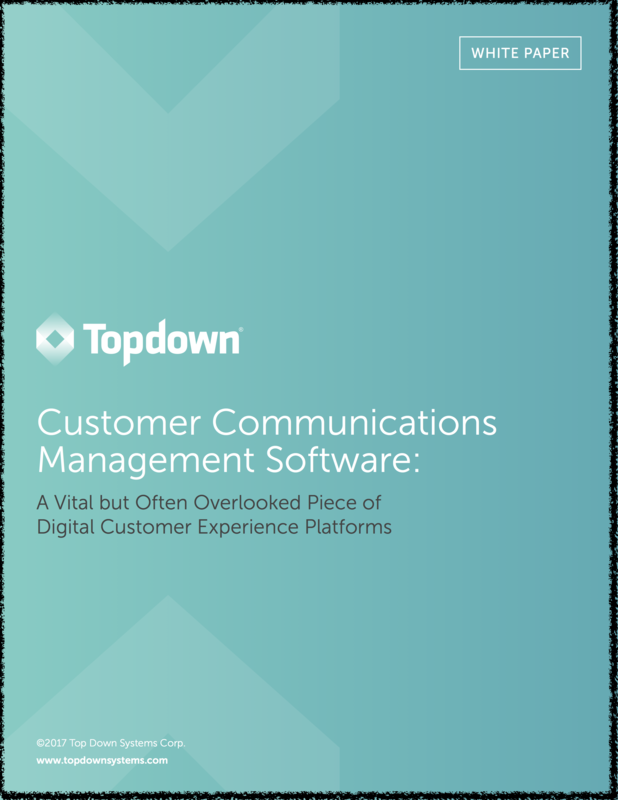 Read our take on connecting customer communications management and digital experience technologies. 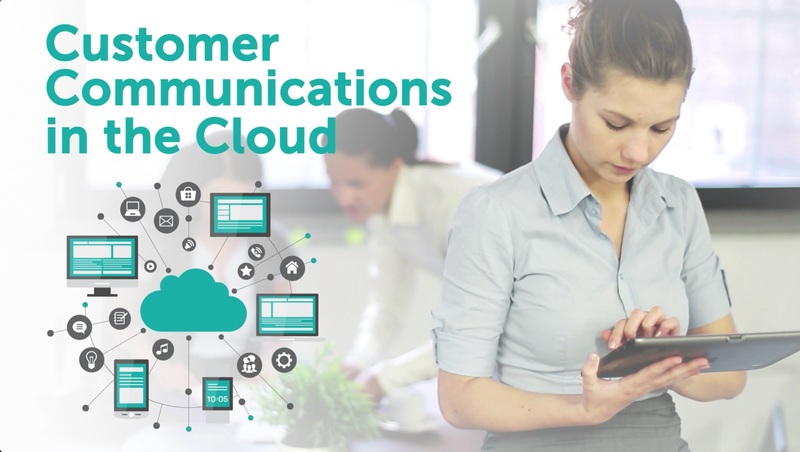 Learn how INTOUCH keeps your customer data and communications secure in the cloud. 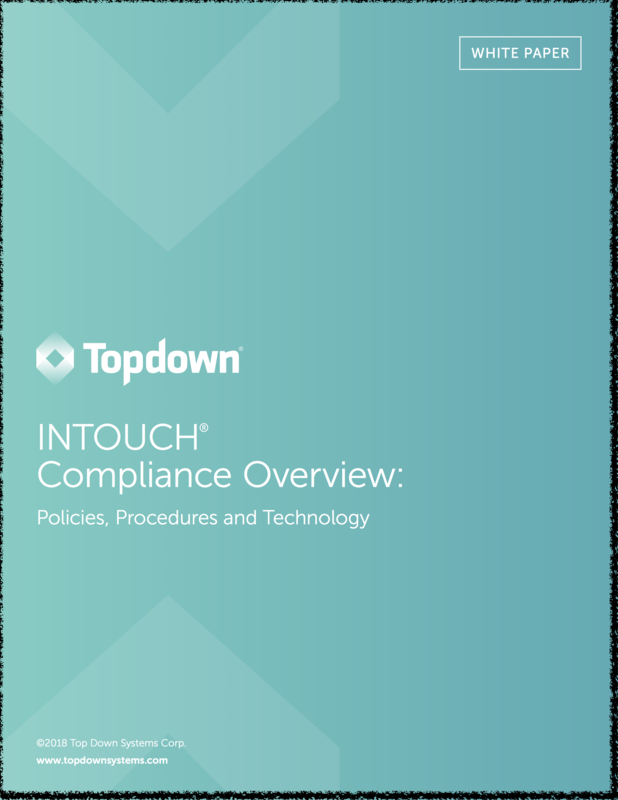 Get an overview of Topdown's approach to compliance with various industry standards. Schedule a demonstration of INTOUCH to see just how easy it is to use and to discuss your specific needs. INTOUCH pricing is based on the number of users (direct users and integrations), and the volume of communications generated through the software. 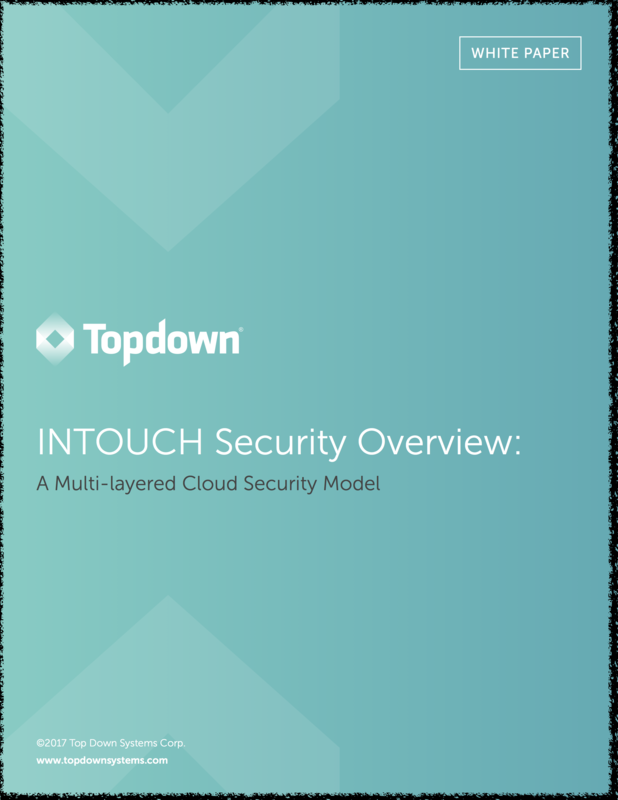 INTOUCH is offered as a hosted SaaS solution, with Topdown managing the multitenant cloud environment. The pricing reflects that standard configuration. Contact Topdown to discuss other deployment options. INTOUCH is hosted on Amazon Web Services (AWS). If you are currently using one or more cloud platforms other than AWS, we can help you integrate with INTOUCH cloud-to-cloud using our REST APIs. There are some additional first-year implementation expenses. Our Professional Services Group will integrate INTOUCH with your data sources and business applications, then train you to use the product. Pricing varies, so please contact us to discuss your environment.